•	The big case size. •	The combined blue scale of tachymeter and chronometer seconds can be hard to read. The red or yellow versions are similarly lacking. Graham is an interesting independent brand. In the last years, it managed to impose its own recognisable style of left-sided crown chronographs and to come with some impressive timepieces. Worthy of mention is the brand’s collaboration with Christophe Claret for the Geo Graham Orrey Tourbillon. 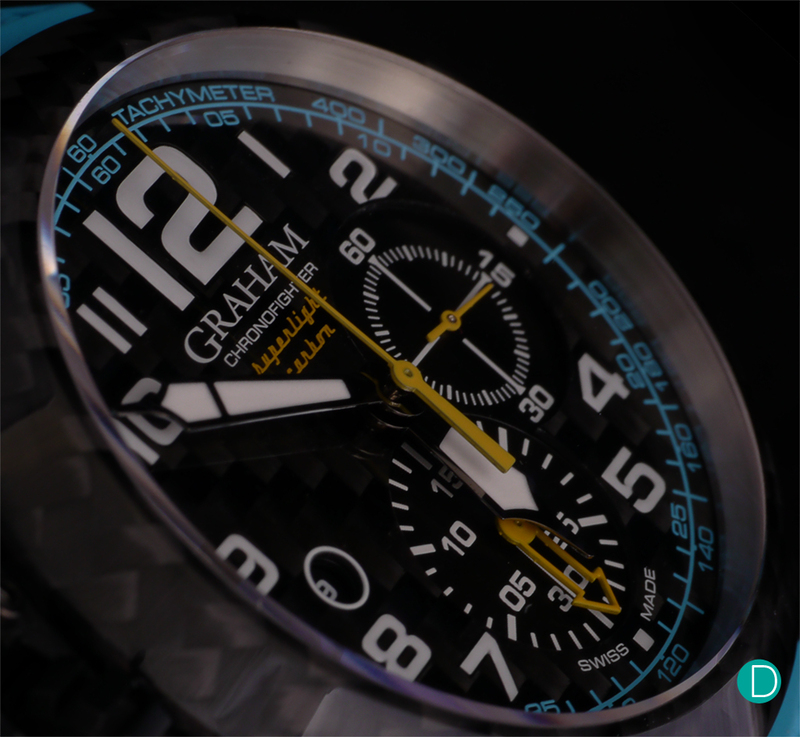 We review today the Graham Chronofighter Superlight Carbon, part of the left-sided crown Chronofighter collection. The newest Chronofighter Superlight Carbon is a bold, recognisable watch. ‘Honest George Graham’, as it was known in the trade was born in 1673, in Kirklinton, a village in England. In 1688, George followed his friend and mentor Thomas Tompion to London where learned the art of clockmaking. During his career, George Graham invented the mercury pendulum and made several improvements of the pendulum clocks. In 1715, he introduced the deadbeat escapement in his precision regulator clocks. In 1722, he was made Master of the Worshipful Company of Clockmakers. Graham was mentor and adviser for other great watchmakers including Thomas Mudge (lever escapement) and John Harrison (marine chronometer). George Graham was also interested in geophysics, being a Fellow of the Royal Society. He practised astronomy and made many improvements and inventions for astronomical instruments. He built a mechanical model of the solar system. The Orrery was the most complex and precise planetarium known at that time. Graham died in 1751 and was buried in the same tomb with his mentor Thomas Tompion. Today, one of his important pieces – the 28-day long case dead beat escapement regulator, built in 1745, can be viewed at Moyse’s Hall Museum. The modern company was founded in 1995 by Eric Loth, Pierre-André Finazzi and Ernst Thomke. The initial name was Les Monts S.A. The company’s concept was to recollect the tradition of the greatest British watchmakers. Under the same roof, two sister brands were released in 1998: Graham and Arnold&Son. In 2001, the company changed its name to The British Masters S.A. The company sold Arnold&Son in May 2010 and changed its name to Graham London. Eric Loth, one of the initial founders, remains at the helm. The reverse 30 minutes counter occupies the lower side of the dial. The skeletonized oversized hand permits a good visibility. 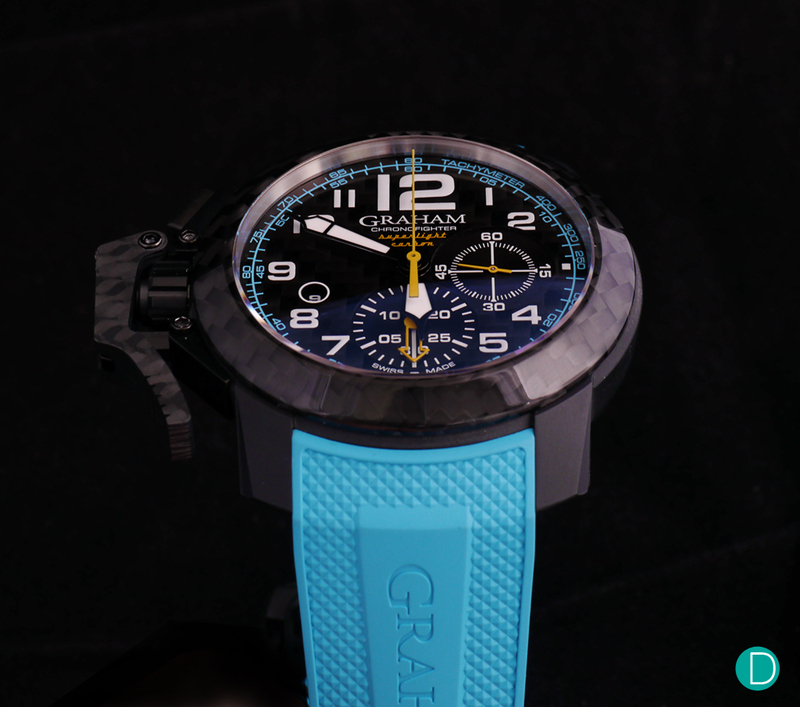 Graham Chronofighter Superlight Carbon Ref. 2CCBK.B30A is the latest addition to the Chronofighter collection. What was once exotic materials in the world of watchmaking are now a bold statement of the brand’s capabilities. Working with carbon for the case’s design is not new in the terms of today’s technologies. From the horological perspective, the things are a little bit different. These new materials are still troubled waters that not all brands are willing to sail. The 47mm case is, by all accounts, a big size. The black carbon composite is light. The entire watch weights less than 100 grams. The large start/stop trigger and the ergonomic crown protection are trademark of the Chronofighter collection. Another design feature to allow the Chronofighter to wear smaller than its dimensions suggest is that the lugs are rather short, and bent downwards. Plus, with the crown and the pusher placed on the left side, it does not poke into the wearer’s wrist (assuming, of course, the watch worn on the left wrist). The rubber strap is soft and pliable and contributes much to the comfort. We think the Clou de Paris pattern makes the rubber strap for good aesthetics. The bezel is manufactured with 3K black carbon fabric texture polished to a shine. This contrasts nicely the matt surface of the rest of the case. The ergonomic crown protection reveals more from the weft of the carbon. Some might feel the elaborate design of the pusher mechanism to activate the chronograph to be superfluous, and perhaps they might be right, but it does give the Chronofighter its unique signature bold look. The dial is covered with domed sapphire crystal with anti-reflective coating on both faces. This coating helps with the unwanted reflections. The case’s back is completed with a smoked sapphire crystal divulging a glimpse of the calibre C1747. The case back fixation is done with six screws. 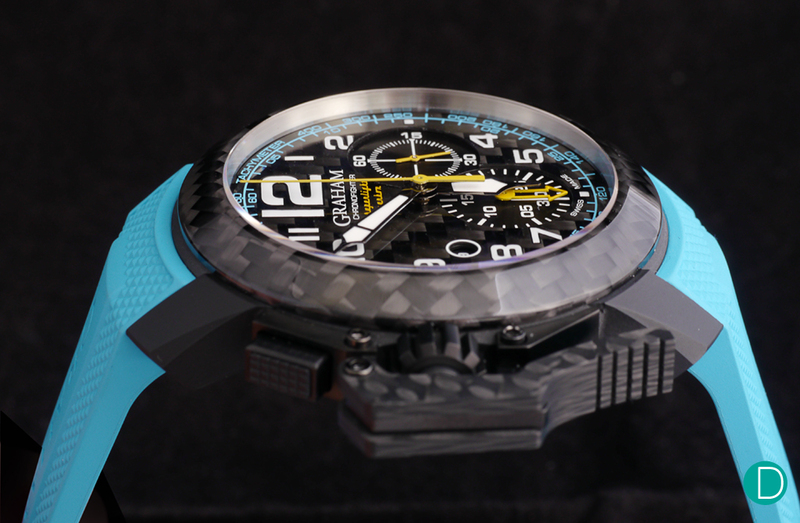 The dial is made of same carbon fibre machining as the rest of the Chronofighter Superlight components. The front view is a true sportive appearance: the blue tachymeter scale makes quite an attractive statement. The blue second’s scale echoing this is also very pleasing to the eye. Visually, it looks great but in practice, the seconds’ indication is hard to read because the scales have different steps. Two other versions are available with either a red or yellow print in place of the blue. The hour markers are arabic with an oversized 12 maintains the sporty appearance. And the large, clear hour and minute hands offer great legibility. The yellow painted chrono’s and seconds’ needles make the suitable chromatic contrast. The small date window has good clarity between the dial’s elements, somehow unexpected due to the small size and being surrounded by bigger items. The smoked sapphire offers an interesting image of the calibre G1747. This movement is based on the Valjoux 7750. Graham makes no excuses for this choice, and we applaud them for using it as it has proven reliability and usability. The movement has an engineering style basic finishing. Still, the G1747 is dress up with haute horlogerie traditional decorations: perlage, Côtes de Genève, brushing and polishing. The 4Hz balance wheel offers 48 hours of power reserve from a single barrel system. The case finishes highlights the beauty of the carbon fibre. 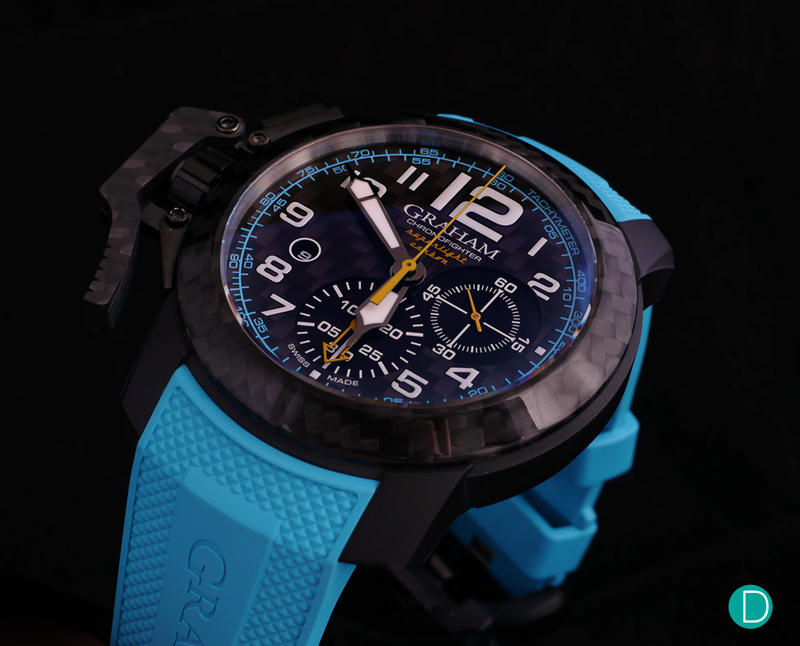 Priced at SG$ 14,873, Graham Chronofighter Superlight Carbon is medium priced between the exotic materials chronographs. The same combination of size, materials and price is not common. A classic choice within a similar price is the Zenith Defy El Primero 21 that we used often in the chronographs competitive landscape. The most exotic one is the 44mm ceramicised aluminium case. The SG$18,000 watch is powered by calibre El Primero 21 C. 9004, but perhaps with the interesting innovation of using two wheel trains: one of 5Hz for the regular time and another running at 50Hz to allow it to measure up to the 1/100th of a second. 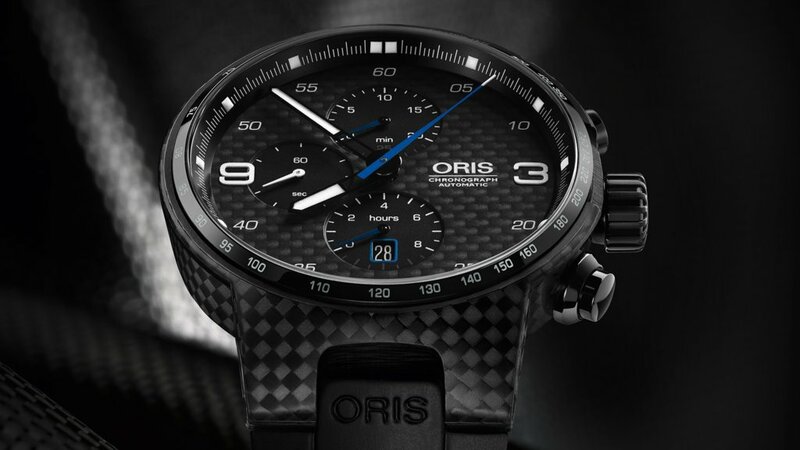 A similar piece that might be considered is the Oris Williams Valtteri Bottas Limited edition. This 770-piece-limited series is part of the 44mm Oris Williams Collection. The case has a multi-part construction of carbon fibre and black DLC titanium. The watch is powered by the Oris Calibre 674, which is also based on the ETA7750 movement. This movement beats at 4Hz and has 48 hours of power reserve. The dial is also made with black carbon fibre. The watch’s face has a sporty look and the hands with Superluminova BG W9 make a spectacular low light view. Priced at €4,250, the Oris watch is perhaps a more cost effective alternative for a smaller wrist and a smaller pocket. Another lightweight and durable carbon Chrono is the Breitling Bentley GMT B04 S Carbon. 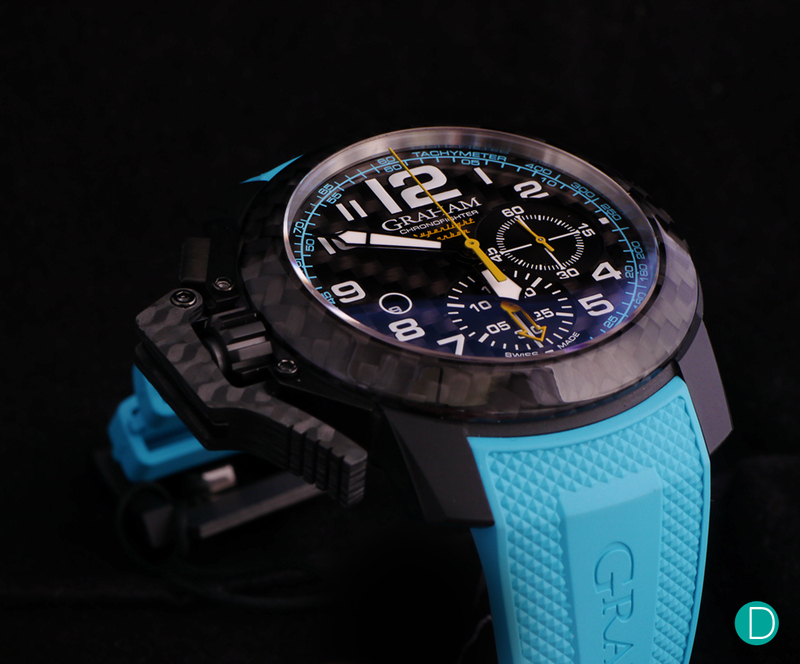 The 45mm carbon case has an asymmetrical lug construction with integrated pushers and offers 100m water resistance. The unusual and interesting looking case uses a high-tech material with 30 microns thick fibres held together by a heat-set resin. The carbon dial features a 24 hours dual time zone function with rotating inner bezel, 12 hours chronograph and a date window. The Bentley GMT B04 S Carbon is powered by a COSC certified, in-house developed and produced, automatic calibre B04. This movement has an impressive 70 hours power reserve, precise released by a 4Hz balance wheel. The Breitling chronograph costs SG$31,280 and is limited to 250 pieces. 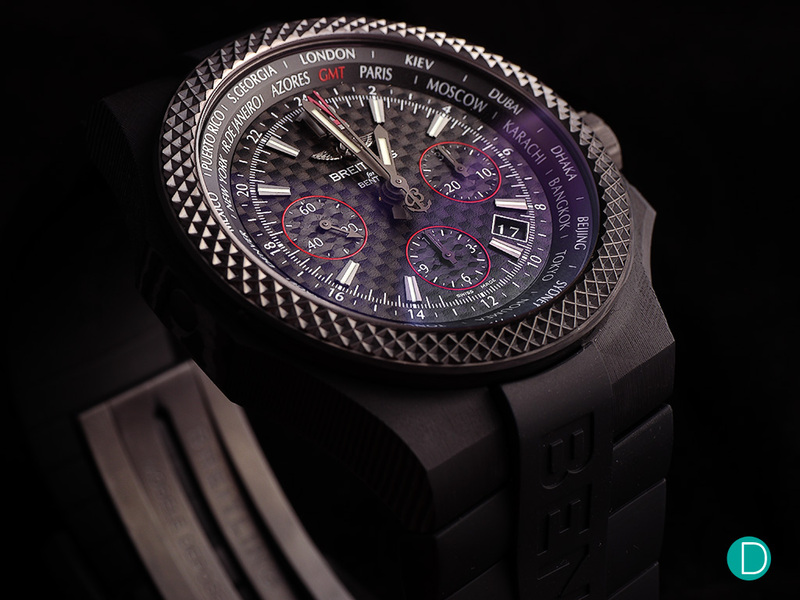 The Breitling for Bentley GMT B04 S Carbon. The red accent, as well as the use of carbon fibre, gives the watch a racing pedigree. 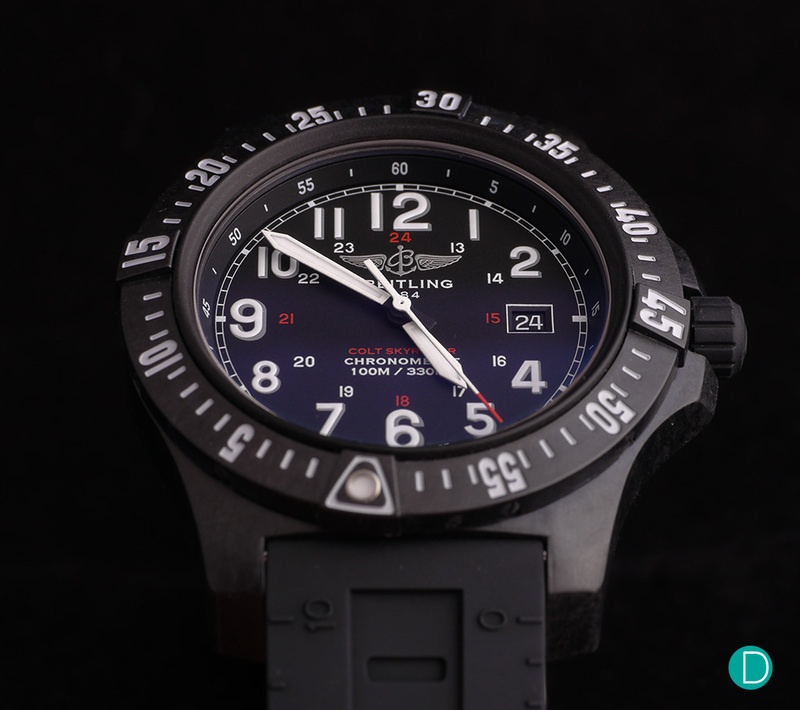 If you are in search for a strictly light weighted, high-tech watch, a possible solution could be the Breitling Colt Skyracer. The watch is manufactured from Breitlight®, a super light material patented by Breitling. The 45mm case has a textured, sporty look due to Breitlight’s texture and diver bezel. The dial uses big Arabic numerals, a 24h indication and a separate inner bezel scale for minutes and seconds indication. The watch is powered by a precise quartz movement with 8 years battery life. The Colt Skyracer has a quick release detachable strap and comes with a price tag of US$2,000. The Breitling Colt Skyracer is the new base model in the Breitling family: low price but high-end technology. From the world of superlatives, we would like to remind the Richard Mille RM 50-03 McLaren F1. The world’s lightest mechanical split second chronograph with tourbillon weighs in at less than 40 grams, including the straps. However be prepared for deep pockets, as the recommended retail is CHF980,000. Graham Chronofighter Superlight Carbon is a well-designed watch: from the weight of fewer than 100 grams including rubber strap, the top-notch materials and manufacturing technologies to the true sportive dial look. The ergonomic design makes it easier to digest for a smaller wrist, though it must be said that it is a large watch. The chronograph is a bold statement for the brand and for the watch owner. The Graham ref. 2CCBK.B30A can be acquired for the price of SG$ 14,873.